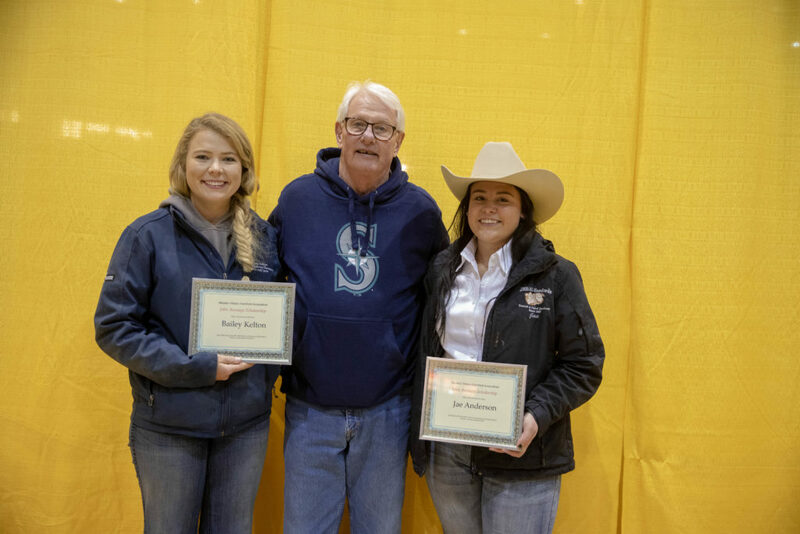 RENO, Nev. — Two $1,500 John Ascuaga scholarships were awarded to Bailey Kelton, Yerington, Nev. and Jae Anderson, Logan, Utah, Friday, Nov. 30, at the Western States National Hereford Show in Reno, Nev. The scholarships were given in recognition of long time Nugget Casino owner, rancher and Hereford advocate, John Ascuaga. Bailey is a sophomore at the University of Nevada – Reno studying veterinary medicine with an interest in meat science and reproduction. She is active in various agricultural clubs and associations including 4-H, FFA and the California Nevada Junior Hereford Association. She hopes to continue her family’s Hereford ranch and to utilize the knowledge acquired from her degree to maintain a successful and healthy herd. Jae is a senior studying agricultural business at Utah State University. She has been a member of the Idaho Junior Hereford Association for 14 years and grew up raising and expanding her own herd of Hereford cattle. Her future goals include working in agricultural lending or accounting with an emphasis on land and livestock. Alongside her brother, Jae also plans to continue her family’s ranching legacy by expanding the operation in terms of performance and size. The Hereford Youth Foundation of America is a 501 (c) 3 not-for-profit. Its mission is to support scholarship, education and leadership activities within the Hereford breed. For more information about the HYFA, visit HerefordYouthFoundation.org or contact the AHA at 816-842-3757. Bailey Kelton, Yerington, Nev., and Jae Anderson, Logan, Utah, were each awarded a $1,500 John Ascuaga scholarship at the 2018 Western States National Hereford Show in Reno, Nev. Pictured (l to r) are: Bailey Kelton; George Sprague, HYFA vice president; and Jae Anderson.